What is the best way to sell to women? Does selling to women require a different strategy than selling to men? Last, do you treat your male clients different then you treat your female clients? A few weeks ago I attended a conference in Southern California geared towards women business owners called Biz Chix Live. It was put on by Natalie Eckdahl, who’s a business coach, speaker, and host of a super successful podcast called Biz Chix (you can find it on iTunes – I recommend it for women business owners). At the end of one of our conference days, there was a group of attendees all gathered together discussing what we learned and business in general. 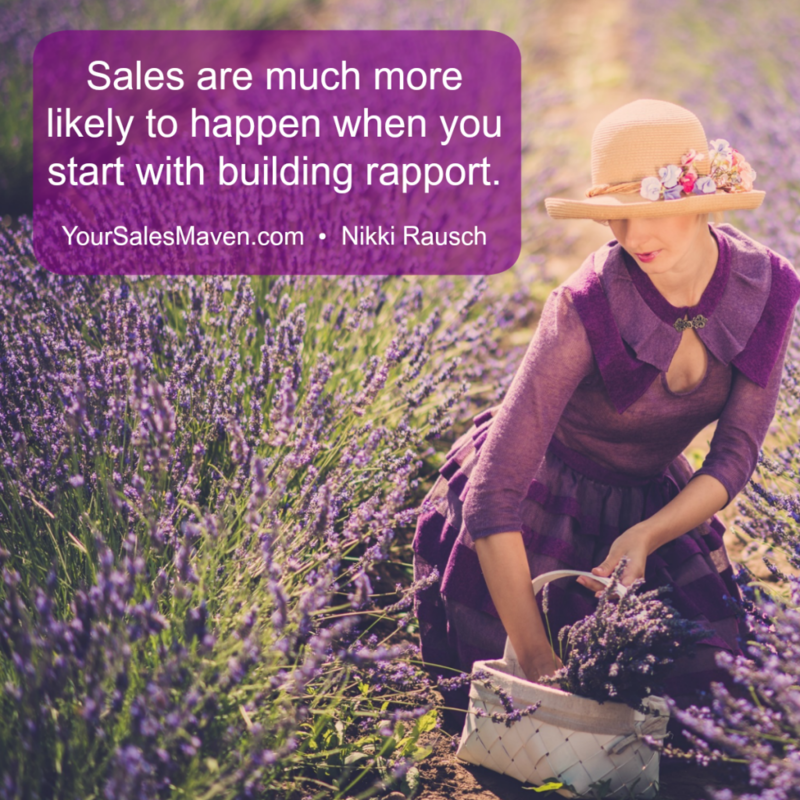 The conversation turned to sales, as it sometimes does when I’m around since it’s the focus of my business. The women started discussing all of the terrible sales strategies people are employing to get their business. One woman asked me if I’ve ever written an article explaining why selling over social media (i.e. Facebook Messenger, LinkedIn Messaging, etc.) doesn’t work. There was not one woman in the group who liked being contacted and then “sold to” in this way. Every one of them was totally turned off by it. Last week in a private group on Facebook this same topic was broached again and I was tagged in the post. A few people who’ve been through my training and/or know my work asked what the best way is to politely suggest to the senders that they consider learning some selling skills. 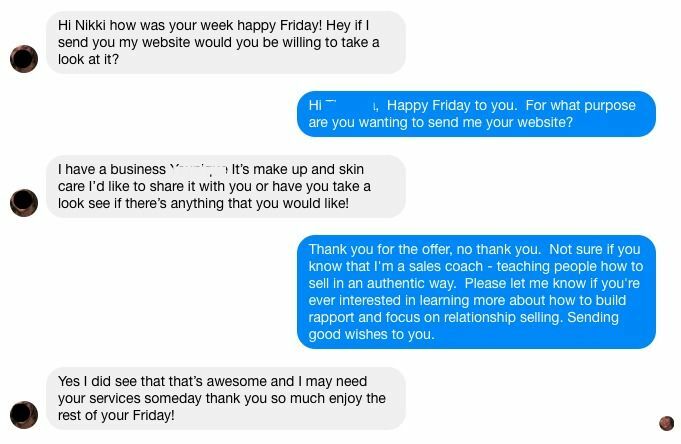 The women in this group are sick of these random, “buy from me” messages showing up and therefore are speaking up about it. I wonder, do people think women like being “sold” to in this way? And, if you’re the person sending these types of messages, would you send these same messages to a man? It seems unlikely. care about relationships. Being “friends” on Facebook does not equal a relationship. (like men) buy from people they Know, Like, & Trust. appreciate authenticity and this approach is inauthentic. are busy. Asking a woman to stop what she’s doing to review your products, look at your website, listen to your training/podcast, watch your videos is asking too much when she doesn’t even know you. Just last week this was an exchange between someone who friended me on Facebook. We’ve never met and have no relationship. Expecting a woman to stop what she’s doing and jump through hoops to buy from you is incredibly short-sighted. Asking someone to look at your website out of the blue is salesy and frankly, it’s lazy. When you invest in building relationships with the women you’d like to do business with, you’ll find that selling to these women gets much easier. The first step is building rapport. There are so many great organizations you can join to build relationships and business. Two of my favorites are Business Among Moms (www.businessamongmoms) and the Biz Chix Coop (www.facebook.com/groups/bizchixcoop). You don’t have to be a mom to be a part of BAM (Business Among Moms) by the way. Both of these groups offer you a way to authentically connect with like-minded women. Spend time making authentic connections before you start hawking your wares and you may just find your business growing at a much faster rate.